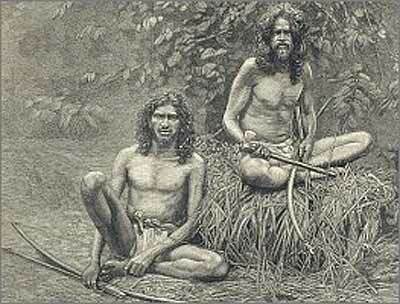 Veddahs, or "Wild Men" of Ceylon, one of the lowest types of the human race. Article and engraving from "The Graphic" of June 14, 1884. This strange and primitive race is generally considered to be the remnant of the aborigines of Ceylon, and its members are but a degree removed from wild beasts. They are divided into two classes, the Rock and Village Veddahs. The latter dwell in rude buts, and are a shade more civilised than the former, who, in caves or the jungle, maintain themselves as they best can, their greatest delicacy being a roast monkey. They are exceedingly harmless, and know nothing of history, religion (beyond a few relics of demon worship), or any art whatever, and are only skilled in archery. They are capital marksmen, and when they want to send an arrow to great distance draw the bow with the foot. "The two Veddahs were photographed by Mr. Scowen, of Kandy, and are two of the party of Veddahs brought up to Kandy for the Prince of Wales to see at the time of his visit to Ceylon, and I am not aware of any Veddahs having appeared until last month, in this or in any other civilised place, since that occasion. Had these men not been here once before, I doubt if the natives I sent after them would have been able to persuade them to come this time. The Veddahs are supposed to be the original inhabitants of the island, and though quite inoffensive people are sunk lower in barbarism than perhaps any other race in the world. They reside in the dense forests in the central and eastern districts of Ceylon, and live by hunting. They possess a language of their own, which is fast dying out, and they cannot count beyond two. Their appearance is that of complete misery and apathy to all around. Efforts have been made by the Ceylon Government to encourage them to leave their wild life and to settle down in villages, which doubtless before long they will all do."